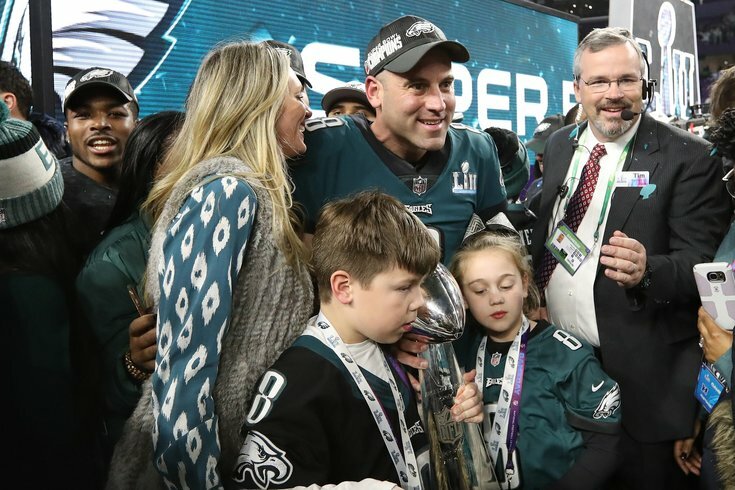 Philadelphia Eagles punter Donnie Jones (8) poses for a photo after a victory with his family and the Vince Lombardi Trophy against the New England Patriots in Super Bowl LII at U.S. Bank Stadium. It's always hard to say goodbye to Eagles who have been with the organization for a long time, particularly after they were part of the first Super Bowl team in franchise history. But it's time to say goodbye to punter Donnie Jones, who announced his official retirement from the NFL on Tuesday morning. Eagles 2018 draft: Trade up, trade back, or stay put? At age 37, Jones was not exactly over the hill at the position and theoretically could have stayed in Eagles green for years to come – earlier in the season, Jones told PhillyVoice's Jimmy Kempski that he planned to play until he was 40. He decided to hang up the cleats anyway, citing a desire to make more time for his family in a statement released through the Eagles' website. After 14 seasons in the NFL, I have decided to retire so that I can spend more time with my family. I am grateful for all those who have supported me throughout the years. Specifically, I would like to thank Jeffrey Lurie, Howie Roseman, Doug Pederson, and the entire Eagles organization for allowing me to be a part of their family for the past five seasons. I will truly miss my teammates, coaches, friends, and the best fans in the NFL. Although I am retiring, I will always be an Eagle and will forever have a special place in my heart for the City of Philadelphia. It is a great honor to be a part of the first Super Bowl championship team in Eagles history and there is no better way to finish my career. While Jones lags behind some of his contemporaries in the raw yardage department — some of which is a product of Philadelphia's offense being great — his ability to punt directionally and put hangtime on the ball was a big factor in the success of the special teams unit. In his final season, returns on Jones' punts produced only 171 total yards, the third-lowest total against any punter in the league last season. There's also the smaller, but no less significant role of serving as the holder during field goal attempts. Jones was as reliable as it gets in that role, and though it's obviously small in the big picture of Philadelphia's success, it is an example of how it took every guy on the roster to finally bring the Lombardi Trophy back to Philadelphia. He leaves the game with plenty of franchise accolades under his belt. Jones retires as the franchise leader in gross punting average (45.37), punts inside the 20 (138), and net-punting average (40.5) among other single-season records he set during his five seasons with the team. Not everything from the Chip Kelly era turned out poorly, after all. In a statement from the organization, the Eagles credited a large chunk of their special teams success to No. 8. We want to congratulate Donnie Jones on reaching the pinnacle of his career and retiring as a Super Bowl champion. Donnie is a professional in every sense of the word and we wish him all the best in retirement. We owe much of our recent special teams success to Donnie, as evidenced by the numerous franchise punting records he set during his five-year run with the Eagles. We will miss Donnie’s ability on the field, but will also miss his enthusiastic personality and the daily commitment he made to engaging with our community and our fan base. Not everything about the move will hurt the Eagles. Philadelphia will save about $1.6 million in cap space as a product of Jones' retirement, which makes Howie Roseman's job just a little bit easier this offseason. Congratulations to Jones on a well-earned retirement. There are few things better than getting to go out on top of the game, and the responsibility now falls to Cameron Johnston to pick up where Jones left off.